Let’s take a moment to reflect on one of the most iconic episodes of the I Love Lucy franchise, the job switching episode. Lucy and Ethel are placed on the assembly line for a candy company and everything appears to be going smoothly as they wrap the chocolate treats, but then the conveyor belt speeds up and causes chaos. This chaos was caused by a Variable Frequency Drive adjusting its speed. Variable Frequency Drives (VFD) are for high-horsepower applications that control the power of the motor by adjusting to weight and speed of a piece of equipment such as a conveyor belt, elevator, or pump. VFDs are a great energy and money saver due to the output regulation of the motor. Servo drives, on the other hand, focus on the movement of the motor such as starting and stopping on a precise location such as a soda bottle stopping on the line to have the liquid pumped into it, the conveyor stops in a specific location in order for this task to occur. Servo drives provide better accuracy for positioning than VFDs and require a lower horsepower motor rating than a VFD. Now you know the difference between a variable frequency drive and a servo motor. 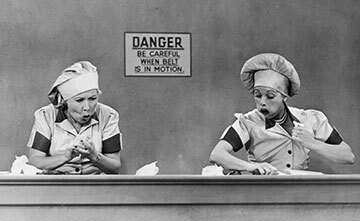 Enjoy watching Lucy and Ethel battle the conveyor belt!